Welcome to Nagarjuna Hotel, Bengaluru Hotel Reservations, Bengaluru Service Apartments, Bengaluru Extended Stay. This 750 sq ft Apartment features a living hall, dining space, two Bedrooms, attached bathroom one ensuite and a kitchen area. The living hall is furnished with a 32” LCD wall mounted TV, a comfortable two seater sofa, one deep arm chair with a center table and a side table. French window in the living hall is furnished with sheer curtains and brocade drapes which open out to a spacious balcony. These apartment features extra dressing space with a wardrobe. Kitchen is furnished with granite counter top with a stainless steel sink unit, over head cabinet; storage shelves under the kitchen counter, 200 liter frosts free Refrigerator, Electric Kettle, Microwave oven. Induction plate, Rice Cooker will be provided on request. Breakfast table is attached to the kitchen counter with two high stools. The dining room is furnished with a 4 seater dining table and is fully equipped with crockery, glassware, coffee mugs and silverware. Each bedroom has its own bathroom, 2 en suite. Each bathroom features a shower cubicle with jet showers, a WC, wash basin with granite counter top, premium sanitary fittings, exhaust fan and running hot and cold water 24/7. In bathroom amenities include bath towels, hand towels, bath mat and complimentary toiletries like shower caps, soap, shampoo and moisturizer. Shaving, dental hygiene necessities and hair dryers are provided on request. The Air conditioned Bedrooms feature three sheeted twin Beds with Duvets, Bed mat, Wardrobe with drawers, Bedside Tables, Study Table with comfortable Chair, drawers luggage rack and an Electronic safe locker. Windows are furnished with sheer curtains and black out drapes and an insect screen. Bangalore a growing city is home to over 6 million people and a base for over 10,000 industries, Bengaluru combines the traditional with the outlook of a modern metropolitan city. 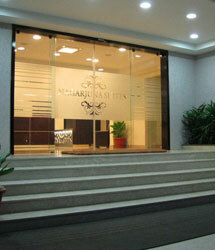 Copyright © Nagarjuna Suites. All rights reserved.